With our nights and mornings becoming darker we start to feel the effects of Summer slowly slipping away. Before our eyes autumn is upon us and the next thing we know it’s winter. At this time of year flowers, like us, tend to start hibernating, so while we are indoors why not brighten your home and mood with an amazing display of quality and vigour. Cyclamen will give you pleasure in a whole range of conditions, indoors or out with a fabulous selection of colours including fringed, bicolour, flames and clear flowers. Cyclamen display their flowers in all their loveliness for many, many weeks during autumn and winter. Flowering freely, they are a real living ‘bunch of flowers’. Cyclamen make a great cut flower lasting a long time, bunches will stay graceful and keep their scent for at least a fortnight. Cyclamen ideally fill an indoor space; decorate balconies, patios, also captivating on a table, a chest of drawers, stairwells, entrance halls, dining tables and bedrooms. To get the best out of your indoor Cyclamen, place in a fairly cool position, their preferred temperature is 13 to 17C. 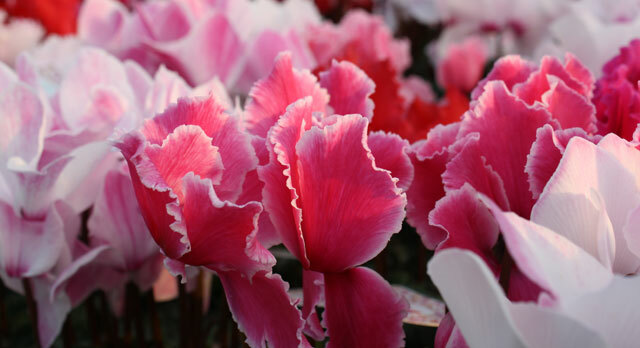 Outdoors, Cyclamen are able to withstand rain, hail, snow and wind. It is very important to water moderately, but regularly at the edge of the pot, never onto the foliage or bulb. Remove any water left in the saucer after half an hour. The potting mix should always be slightly damp, do not over water or let it get really dry. Fertilise using 'Oderings Total Replenish'. Withered flowers and foliage should be taken off with a twist of the stem. When flowering is over (October/November) water less, eventually stopping altogether. Place the plant in a shaded spot or keep the pot in a cool place like the garage. Re-pot in February/March with Oderings Potting Mix and start watering to revive your plant. We hope you enjoy these flowers which last for more than five months of the year! Enjoy the beauty of your Cyclamen, a living bunch of flowers. TOP TIP: Enjoy all your Cyclamen has to offer indoors during autumn and winter, and when the plant is looking a little sad plant it out into your garden for a beautiful spring display.